This article is about the trees and their fruit. For other uses, see Apricot (disambiguation). An apricot is a fruit, or the tree that bears the fruit, of several species in the genus Prunus (stone fruits). Usually, an apricot tree is from the species P. armeniaca, but the species P. brigantina, P. mandshurica, P. mume, P. zhengheensis and P. sibirica are closely related, have similar fruit, and are also called apricots. The scientific name armeniaca was first used by Gaspard Bauhin in his Pinax Theatri Botanici (1623), referring to the species as Mala armeniaca "Armenian apple". Linnaeus took up Bauhin's epithet in the first edition of his Species Plantarum in 1753, Prunus armeniaca. Apricot first appeared in English in the 16th century as abrecock from the Middle French aubercot or later abricot, from Spanish albaricoque and Catalan a(l)bercoc, in turn from Arabic الْبَرْقُوق (al-barqūq, "the plums"), from Byzantine Greek βερικοκκίᾱ (berikokkíā, "apricot tree"), derived from late Greek πραικόκιον (praikókion, "apricot") from Latin [persica] praecocia (praecoquus, "early ripening" [peach]). The apricot is a small tree, 8–12 m (26–39 ft) tall, with a trunk up to 40 cm (16 in) in diameter and a dense, spreading canopy. The leaves are ovate, 5–9 cm (2.0–3.5 in) long and 4–8 cm (1.6–3.1 in) wide, with a rounded base, a pointed tip and a finely serrated margin. The flowers are 2–4.5 cm (0.8–1.8 in) in diameter, with five white to pinkish petals; they are produced singly or in pairs in early spring before the leaves. The fruit is a drupe similar to a small peach, 1.5–2.5 cm (0.6–1.0 in) diameter (larger in some modern cultivars), from yellow to orange, often tinged red on the side most exposed to the sun; its surface can be smooth (botanically described as: glabrous) or velvety with very short hairs (botanically: pubescent). The flesh is usually firm and not very juicy. Its taste can range from sweet to tart. The single seed is enclosed in a hard, stony shell, often called a "stone" or "kernel", with a grainy, smooth texture except for three ridges running down one side. 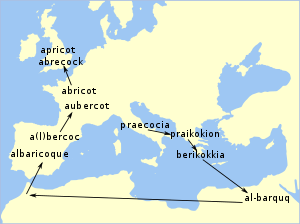 The origin of the apricot is disputed and unsettled. It was known in Armenia during ancient times, and has been cultivated there for so long that it is often thought to have originated there. Its scientific name Prunus armeniaca (Armenian plum) derives from that assumption. For example, the Belgian arborist baron de Poerderlé, writing in the 1770s, asserted, "Cet arbre tire son nom de l'Arménie, province d'Asie, d'où il est originaire et d'où il fut porté en Europe ..." ("this tree takes its name from Armenia, province of Asia, where it is native, and whence it was brought to Europe ..."). An archaeological excavation at Garni in Armenia found apricot seeds in a Chalcolithic-era site. Despite the great number of varieties of apricots that are grown in Armenia today (about 50), according to the Soviet botanist Nikolai Vavilov, its center of origin would be the Chinese region, where the domestication of the apricot would have taken place. Other sources say that the apricot was first cultivated in India in about 3000 BC. Its introduction to Greece is attributed to Alexander the Great. Subsequent sources were often confused about the origin of the species. John Claudius Loudon (1838) believed it had a wide native range including Armenia, the Caucasus, the Himalayas, China, and Japan. 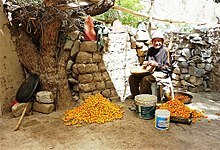 Apricots have been cultivated in Persia since antiquity, and dried ones were an important commodity on Persian trade routes. Apricots remain an important fruit in modern-day Iran. Egyptians usually dry apricots, add sweetener, and then use them to make a drink called amar al-dīn. In England during the 17th century, apricot oil was used in herbalism treatments intended to act against tumors, swelling, and ulcers. Apricots have a chilling requirement of 300 to 900 chilling units. A dry climate is good for fruit maturation. The tree is slightly more cold-hardy than the peach, tolerating winter temperatures as cold as −30 °C (−22 °F) or lower if healthy. They are hardy in USDA zones 5 through 8. A limiting factor in apricot culture is spring frosts: They tend to flower very early (in early March in western Europe), meaning spring frost can kill the flowers. Furthermore, the trees are sensitive to temperature changes during the winter season. In China, winters can be very cold, but temperatures tend to be more stable than in Europe and especially North America, where large temperature swings can occur in winter. Hybridisation with the closely related Prunus sibirica (Siberian apricot; hardy to −50 °C (−58 °F) but with less palatable fruit) offers options for breeding more cold-tolerant plants. They prefer well-drained soils with a pH of 6.0 to 7.0. Apricot cultivars are usually grafted onto plum or peach rootstocks. The cultivar scion provides the fruit characteristics, such as flavour and size, but the rootstock provides the growth characteristics of the plant. Some of the more popular US apricot cultivars are 'Blenheim', 'Wenatchee Moorpark', 'Tilton', and 'Perfection'. Some apricot cultivars are self-compatible and do not require pollinizer trees; others are not: 'Moongold' and 'Sungold', for example, must be planted in pairs so that they can pollinate each other. Hybridisors have created what is known as a "black apricot" or "purple apricot", (Prunus dasycarpa), a hybrid of an apricot and the cherry plum (Prunus cerasifera). Other apricot–plum hybrids are variously called plumcots, apriplums, pluots, or apriums. Apricots are susceptible to various diseases whose relative importance is different in the major production regions as a consequence of their climatic differences. For example, hot weather as experienced in California's Central Valley will often cause pit burn, a condition of soft and brown fruit around the pit. Bacterial diseases include bacterial spot and crown gall. Fungal diseases include brown rot caused by Monilinia fructicola: infection of the blossom by rainfall leads to "blossom wilt" whereby the blossoms and young shoots turn brown and die; the twigs die back in a severe attack; brown rot of the fruit is due to Monilinia infection later in the season. Dieback of branches in the summer is attributed to the fungus Eutypa lata, where examination of the base of the dead branch will reveal a canker surrounding a pruning wound. Other fungal diseases are black knot, Alternaria spot and fruit rot, and powdery mildew. Unlike peaches, apricots are not affected by leaf curl, and bacterial canker (causing sunken patches in the bark which then spread and kill the affected branch or tree) and silver leaf are not serious threats, which means that pruning in late winter is considered safe. According to the UN Food and Agriculture Organization, world production of apricots in 2017 was 4.3 million tonnes, led by Turkey with 23% of the world total (table). Other major producers (in descending order) were Uzbekistan, Italy, Algeria, and Iran. In a 100-gram amount, raw apricots supply 48 Calories and are composed of 11% carbohydrates, 1% protein, less than 1% fat and 86% water (table). Raw apricots are a moderate source of vitamin A and vitamin C (12% of the Daily Value each). Dried apricots are a type of traditional dried fruit. The world's largest producer of dried apricots is Turkey. When treated with sulfur dioxide (E220), the color is vivid orange. Organic fruit not treated with sulfur dioxide is darker in color and has a coarser texture. When apricots are dried, the relative concentration of nutrients is increased, with vitamin A, vitamin E, potassium and iron having Daily Values above 25% (table). Apricots contain various phytochemicals, such as provitamin A beta-carotene and polyphenols, including catechins and chlorogenic acid. Taste and aroma compounds include sucrose, glucose, organic acids, terpenes, aldehydes and lactones. Apricot kernels (seeds) contain amygdalin, a poisonous compound. On average, bitter apricot kernels contain about 5% amygdalin and sweet kernels about 0.9% amygdalin. These values correspond to 0.3% and 0.05% of cyanide. Since a typical apricot kernel weighs 600 mg, bitter and sweet varieties contain respectively 1.8 and 0.3 mg of cyanide. The apricot is the national fruit of Armenia, mostly growing in the Ararat plain. It is often depicted on souvenirs. The Chinese associate the apricot with education and medicine. For instance, the classical word 杏 壇 (literally: "apricot altar") (xìng tán 杏坛) which means "educational circle", is still widely used in written language. Chuang Tzu, a Chinese philosopher in the fourth century BC, told a story that Confucius taught his students in a forum surrounded by the wood of apricot trees. The association with medicine in turn comes from the common use of apricot kernels as a component in traditional Chinese medicine, and from the story of Dong Feng (董奉), a physician during the Three Kingdoms period, who required no payment from his patients except that they plant apricot trees in his orchard upon recovering from their illnesses, resulting in a large grove of apricot trees and a steady supply of medicinal ingredients. The term "expert of the apricot grove" (杏林高手) is still used as a poetic reference to physicians. The fact that apricot season is short has given rise to the common Egyptian Arabic and Palestinian Arabic expression filmishmish ("in apricot [season]") or bukra filmishmish ("tomorrow in apricot [season]"), generally uttered as a riposte to an unlikely prediction, or as a rash promise to fulfill a request. In Middle Eastern and North African cuisines, apricots are used to make Qamar al-Din (lit. "Moon of the Religion"), a thick apricot drink that is a popular fixture at Iftar during Ramadan. Qamar al-Din is believed to originate in Damascus, Syria, where the variety of apricots most suitable for the drink was first grown. The Turkish idiom bundan iyisi Şam'da kayısı (literally, "the only thing better than this is an apricot in Damascus") means "it doesn't get any better than this". In the US Marines it is considered exceptionally bad luck to eat or possess apricots, especially near tanks. This superstition has been documented since at least the Vietnam War and is often cited as originating in World War II. Even naming them is considered unlucky, so they are instead called "cots", "Forbidden fruit" or "A-fruit". ^ Bortiri, E.; Oh, S.-H.; Jiang, J.; Baggett, S.; Granger, A.; Weeks, C.; Buckingham, M.; Potter, D.; Parfitt, D.E. (2001). "Phylogeny and systematics of Prunus (Rosaceae) as determined by sequence analysis of ITS and the chloroplast trnL-trnF spacer DNA". Systematic Botany. 26 (4): 797–807. JSTOR 3093861. ^ Linnaeus, C. (1753). Species Plantarum 1:474. ^ "abricot (French)". Centre National de Ressources Textuelles et Lexicales. ^ "apricot". The American Heritage Dictionary of the English Language (5th ed.). Boston: Houghton Mifflin Harcourt. 2014. ^ Dean, Sam (9 May 2013). "On the Etymology of the Word Apricot". Bon Appetit. Retrieved 22 October 2018. ^ Rushforth, K. (1999). Trees of Britain and Europe. Collins ISBN 0-00-220013-9. ^ a b "VII Symposium on Apricot Culture and Decline". Actahort.org. Retrieved 2012-06-22. ^ De Poerderlé, M. le Baron (1788). Manuel de l'Arboriste et du Forestier Belgiques: Seconde Édition: Tome Premier. Brussels: Emmanuel Flon. p. 682. ^ Arakelyan, B. (1968). "Excavations at Garni, 1949–50", p. 29 in Contributions to the Archaeology of Armenia. Henry Field (ed.). Cambridge. ^ a b Huxley, A., ed. (1992). New RHS Dictionary of Gardening. Vol. 1, pp. 203–205. Macmillan. ISBN 0-333-47494-5. ^ Loudon, J. C. (1838). Arboretum Et Fruticetum Britannicum. Vol. II. London: Longman, Orme, Brown, Green and Longmans. pp. 681–684. The genus is given as Armeniaca. ^ "Prunus sibirica Siberian Apricot PFAF Plant Database". pfaf.org. ^ a b "Production Quantities of Apricots by Country in 2017; Crops/World Regions/Production Quantity from picklists". Food and Agriculture Organization of the United Nations, Statistics Division (FAOSTAT). 2018. Retrieved 2019-02-19. ^ Ingels, Chuck, et. al. (2007). The Home Orchard: Growing Your Own Deciduous Fruit and Nut Trees. University of California Agriculture and Natural Resources. p. 27. ISBN 1-879906-72-4. ^ a b Hessayon, D.G. (2004). The Fruit Expert. London: Expert Books. ^ Munkvold, Gary P. (2001). "Eutypa Dieback of Grapevine and Apricot". Plant Health Progress. doi:10.1094/PHP-2001-0219-01-DG. ^ Smith, Andrew F. (ed.) (2007). The Oxford Companion to American Food and Drink. Oxford University Press. ISBN 9780195307962. p. 22. ^ Campbell, O. E.; Merwin, I. A.; Padilla-Zakour, O. I. (2013). "Characterization and the effect of maturity at harvest on the phenolic and carotenoid content of Northeast USA Apricot (Prunus armeniaca) varieties". Journal of Agricultural and Food Chemistry. 61 (51): 12700–10. doi:10.1021/jf403644r. PMID 24328399. ^ Xi, W; Zheng, H; Zhang, Q; Li, W (2016). "Profiling Taste and Aroma Compound Metabolism during Apricot Fruit Development and Ripening". International Journal of Molecular Sciences. 17 (7): 998. doi:10.3390/ijms17070998. PMC 4964374. PMID 27347931. ^ Grigoryan, Marianna (25 June 2010). "Apricot Farmers Struggling in Armenia amid Crop Failure". EurasiaNet. Retrieved 15 July 2018. ^ Schleifer, Yigal (2 July 2010). "More on Armenia's Bitter Apricot Harvest". EurasiaNet. Retrieved 15 July 2018. As a symbol of national pride the image of apricots is included in Armenian souvenirs. ^ "《莊子·漁父》". Ctext.org. Retrieved 2012-06-22. ^ Guo, Zhaojiang (1995). "Chinese Confucian culture and the medical ethical tradition". Journal of Medical Ethics. 21 (4): 239–246. doi:10.1136/jme.21.4.239. PMC 1376720. PMID 7473645. ^ Robertson, Amy (2017-06-08). "All Over The World, Thirsty Muslims Have Their Ramadan Go-To Drinks". NPR. Retrieved 2018-05-22. ^ Denker, Joel (2016-06-14). "'Moon Of The Faith:' A History Of The Apricot And Its Many Pleasures". NPR. Retrieved 2018-05-22. ^ S.SGT. Bob Donner. "Taste for Apricots Canned at Cua Viet". US Marines Armored Tractor Division. ^ Cpl. Derek A. Shoemake (October 27, 2000). "Apricots, AAVs no happy pair". ^ Michael M. Phillips (March 3, 2003). "Superstitions Abound at Camp As Soldiers Await War in Iraq". ^ Paul Dickson (1994). War Slang: American Fighting Words & Phrases Since the Civil War. p. 267. Wikimedia Commons has media related to Prunus armeniaca.